A highly effective sound absorption product, HushScreen reduces reverberated noise to improve comfort and productivity in the workplace. It can be framed for office workstation surrounds and partitions or used as a pre-finished acoustic wall panel. 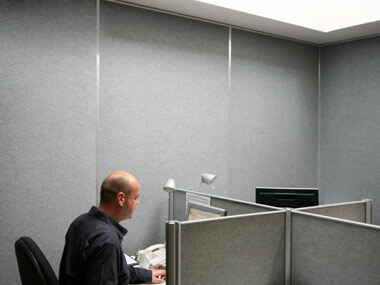 HushScreen is also suitable for controlling reverberated noise in education, retail and other commercial environments. HushScreen is a pre-finished acoustic screen product made from high-density 100% polyester, designed for use in office workstation manufacture. It comes as a lightweight semi-rigid panel ready for use, allowing greater flexibility of design and ease of manufacture. Available in two thicknesses, 6mm and 12mm, HushScreen has a pin-receptive surface that enables it to double as a notice board. 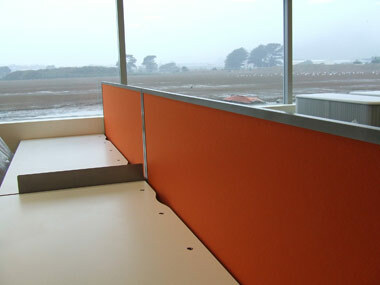 Acoustic and pin board surface for modular office partition panelling, Display, privacy and noise control when framed for modular room divider framed for freestanding, or direct fix acoustic panel, Decorative and functional acoustic wall covering/free standing screen for education, retail, and commercial interiors. 100% polyester fibre without chemical binders or retardants. 25mm or 50mm thick panels.